Possible Causes and Effective Treatment Solutions. Controlling Foam and Scum, in Swimming Pools!!! Start with the water chemistry. Most likely you added algaecide, because of an algae problem. Your sanitation might be inadequate and in need of help or some backup protection. A ColorQ, All-Digital Tester can perform all of the common pool water tests and eliminates the color-matching and guesswork. Reliable water testing will help get the pool swimming-ready. Better Circulation helps make everything work more effectively. The Circulator is a return jet replacement fitting, that improves filtration, eliminates dead zones that promote algae growth, improves sanitizer distribution and improves heat dispersion. A Solar-Powered, Robotic Pool Skimmer/Cleaner works autonomously to keep the pool cleaner and remove the wind-blown debris, before it sinks, to the pool floor. Most pools use some sort of chlorine. A salt chlorine generator is definitely a better way to do chlorine. Salt chlorine generators are highly automated and give you better control. The salt level is about that found in human tears. No installation models are available, that are plug and play ready. Adding a solar-powered pool mineralizer adds copper and zinc ions, that provide algae control and additional sanitizing. This reduces the amount of chlorine required, to maintain an optimum level. Adding a Solar UV Sanitizer is simple - just place it in the pool. It doesn't replace chlorine, but will provide better results, less odor and reduce chlorine usage. How to control foaming and scum deposits, in swimming pools? Foaming and scum formation are serious detractions from the goal of crystal clear swimming pool water. A few pool chemicals: such as biguanide and "quat" algaecides do cause very low levels of foam. This level of foaming is not excessive and is fairly inconspicuous. However, if there is an air leak in the return lines, this can lead to a higher level of pool water foaming and the creation of unacceptable water conditions. While an anti-foam can help, the problem is more of a mechanical nature - fix the air leak! Scum formation occurs when body oils, cosmetic residues, waste and chemical byproducts conspire to form insoluble materials. It is not, usually, a major problem and can be controlled and eliminated with the use of cleaning agents or enzyme products. If problems arise, refer to the Pool Problems Page, as a source of problem-solving information, broken down into various categories. Scroll down the page and click on the linked keywords, catch phrases or images, in the archived answers below, to access additional information, on that topic or product. Do you know what's in your water? If you're having problems, with water clarity or quality, you should be testing for a range of parameters, to better understand the extent and cause of the problem. This helps select the best treatment option. Understanding the nature of the problem, should be step one. For information about our full selection of water testing options, visit our Test Equipment Store. ► Algae Control Without Causing A Foaming Pool? We just moved into a house with an in-ground swimming pool. Our old house had an above-ground pool. One of the things that I disliked about the old pool was the foamy water problems caused by using an algaecide. I don't want to ruin the look of this pool. Are there algaecides that don't foam? Willing to listen. Actually, there are algaecides that do not cause foam. The best choices are: polymer (polyquat) algaecides or chelated copper algaecides. The polymer algaecides are more expensive, but are highly effective against most types of algae. The chelated copper algaecides are very cost-effective and are excellent in vinyl pools and for use against the common varieties of algae, as well as mustard algae. While it is true that the very common "quat" algaecides do have a tendency to foam, it is not normally problematic or unsightly. In those instances, where unsightly pool water foaming is occurring, it is highly probable that there is an air leak in a suction line. A pinhole sized leak can allow air to be sucked in and this, in turn, leads to aeration and foaming. Something worth checking into? Instead of using algaecide, which can cause foaming, you could add a Solar-Powered Dual-Ion Purifier-Mineralizer. 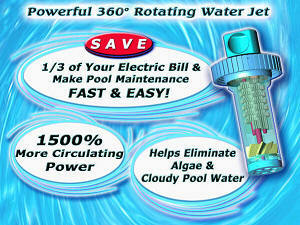 You shouldn't have to use algaecides, thereafter, and it will reduce your chlorine usage. If this website was helpful, in solving your problem, please consider joining our E-Letter Mailing List. You'll receive E-Letters, with helpful information, new product updates, suggestions and sale announcements. I hope that I have provided the solution. Dear Alan, I found your website after searching for a reason for the frothy foam in my inground pool. The pool company opened our pool last week, and as soon as the water level was high enough and I turned the filter on, foam formation began. After a few days of this, I called them and they gave me a bottle of defoamer. This worked when applied, but the next day I had foam again. The foam does dissipate when the filter has not been on for a significant amount of time. When I contacted them again, they said to let the filter keep running, that perhaps someone had "added soap and pulled a prank." They said they do not use algaecides that foam, and insinuated that this was somehow MY fault. I find this highly unlikely, as my pool area is very secure, and I have done nothing to the pool except turn on the filter. They also closed my pool last fall for me. In addition, when I emptied the skimmer today, I noticed a gummy greenish-gray substance inside the walls of the skimmer. I have no idea what this may be. Could it be related to the foam? It has been suggested to me that the wrong kind of algaecide was added when the pool was opened (they did add a quart, although I don't know the brand). Your website also mentioned a leaky air return. Do you have any suggestions for me? Should I continue to wait to see if the foam goes away, or contact the company that opened the pool again and maybe suggest to them that they check the air flow? Thanks for your help. I found your website extremely helpful and well organized! Sincerely. It is not possible to rule out vandalism. It does happen! The "gummy" material could be coagulated dead algae and debris. A shock treatment could be in order. As for the blame, no one has to be at fault. Algaecides that contain ingredients like or similar to dimethyl benzyl ammonium chloride are known to cause some pool water foaming. Usually it is at acceptably low levels: that is unless there is a leak in a suction line. It would not be unusual to have such a leak after a dormant winter and spring startup. The antifoam will help and, if it is due to an algaecide, it will taper off. The algaecide could have been part of the winter closing or the spring opening. I suggest that you shock the pool and give it a bit more time. If things do not improve, get back to me and we'll try something. Solar-Powered Pool Mineralizers afford some continuous algae control and do not cause foamy swimming pool water problems. Something to consider, in the future? To better assure proper overall pool water chemistry, visit a pool store that has a very reliable, professional lab such as a WaterLink SpinTouch Lab, rather than a less accurate test kit or strip reader. I hope that I have been of assistance. Good luck. ► A Matter Of Foam? Our pool pump/filter was not working for a while, and during that time our pool became green. We now have our pump/filter working, so we began the process of "de-greening" our pool. Well, in this process, we used too much algaecide in our pool. We now have a very fine soapy film on the pool. Help!! I have backwashed several times, but I can not seem to get it cleared up. It is getting better with each battle, but is there anything else I can do? Or, should I just keep backwashing, several times a day, and shocking each day until it clears up. Thanks. You probably added an algaecide with dimethyl benzyl ammonium chloride or something similar. This type of product does have a tendency to cause foaming. An air leak in the suction lines, which is not unusual, especially, at pool opening time, will worsen the situation. Check all connections! To control the foaming, add some Spa Formula antifoam, as directed. More is not better! I suggest that you stop using that type of algaecide and consider either a polymer formula or, more conveniently, a Dual-Ion Solar-Powered Pool Mineralizer. Use the antifoam, as needed, until then. The foam problem should dissipate, as the season progresses. Backwashing or shock treatment should have no effect on the foaming. Adding an enzyme product might help eliminate some of the foam and aid in the cleanup. 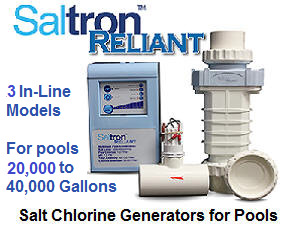 Instead of using chlorine, why not add a salt chlorine generator. It provides better control of the chlorine level, making algae problems less likely. I hope the information proves helpful to you. Alan: After opening our pool this spring, I have noticed bubbles coming out of the pool jets the entire time the pump is running. We have a 30,000 gal pool on a sand filter. Is the problem due to some sort of leak in my system? The pool is equipped with an ionizer. Thanks. You mentioned that you have an ionizer and that should rule out the possibility of an algaecide causing the pool water foaming. It would not be unusual for this problem to occur, after the springtime pool opening. I suspect that there is an air leak in a suction line - somewhere between the skimmers and the filter. Check all the connections. Fix A Leak has been successful, at sealing small air leaks, such as you are describing. Good luck and I hope that I have been helpful. I was just wondering what is the best chemical solution for cleaning my pool. To get all the body oil's and lotion off, along with the scum. Shock treatment could remove some of the deposits. A pool cleaner, formulated not to cause foaming, could help remove some. However, the best choice might be an enzyme product. There are products that allow enzymes to be added to the pool water, where they will help decompose oily residues. Many enzyme treatments, are specifically formulated, for this purpose. Some cleaning products contain enzymes, as well. The enzyme approach would be my choice. Good luck and I hope that the recommendations help. I think that some of the neighborhood kids threw some bubble bath or detergent into my pool. The foaming just happened so quickly, so I'm fairly certain that's what happened. Is there something that you can recommend to deal with all of this froth? I need help. Thanks. I guarantee nothing, but here are a few things to try. Adding an Anti-Foam Product (used in spas) will help knock down the foam, but is not a cure all. Adding an Enzyme Product will help digest or decompose the foaming agent, but it will act slowly. Add a dose of "quat" algaecide (dimethyl benzyl ammonium chloride) to the pool. This product is incompatible, with both the bubble bath and detergent, and will chemically react with those materials. This will, most likely, cause cloudiness that should be treated with shock and one of those "Blue Clarifiers." Follow up with an Enzyme Product. Good luck with the problem. ► A Foaming Pool Problem And More? We have been trying to "open" our pool for approximately one week and cannot seem to keep the pump working because it keeps clogging up with foam. The foam appears to lay on the surface and has a scummy appearance when the pump is not being used. When the pump is running, the foam gets worse - much worse! The water is very cloudy and is bluish/green in color. We have tried adding shock to up the chlorine level, but that only worsened the situation. We have tried adding a multi-purpose product, but that only helped temporarily. Most recently, we have tried draining a good bit of the water and refilling it with fresh water. Nothing seems to help! The pool is approximately 44,000 gallons. Comments, suggestions? Please send. Thank you! You have more than one problem: algae, no filtration and probably an air leak in the return line. Start by raising the Free Chlorine level to 5-10 PPM. Add 4-5 pounds of shock every few hours, until the Free Chlorine is raised and maintained. If necessary, set the filter to recirculate, but keep the water moving. The algae is clogging the filter. Make some progress on the Free Chlorine front and the battle over the filter will be solved. Clean the filter, as needed. A leak in the suction lines can cause foaming. The algae is not helping and, if you added a "quat" algaecide, it may have contributed to the foaming. Check all connections. I hope that the information will prove helpful. ► Pool Is Sudsing Up? I recently use a tile soap [mixed with acid and water] to clean my pool tile. My surprise that they don't use a low/no sudsing formula. My pool now has bubble [originating at the hot tub pour-over] that it NEVER had. I've added a defoamer once, which worked pretty well, but then the bubbles returned rather quickly. Any suggestions would be appreciated. Thanks. If the product was intended to clean shower tiles, the end result is not unexpected. In a shower the suds go down the drain. In a pool, the suds end up in the water. If the product was intended for pool use, it could or "should" have been formulated with low foaming detergents. Antifoam will help, but is only temporary. Try adding an enzyme product to the pool, as this can help digest (decompose) materials causing the problem. It may take a while to make a noticeable difference. Good luck and I hope that I have been of some assistance. We have a perfect pool! Thanks for your help. My pool has some sticky, oily deposits around the water and in the skimmer. I think I know what it is. I try to keep the use of sun lotions to a minimum, if I plan on going into the water. The kids - that's another matter. Any suggestions? You are probably correct that excessive use of oily sun tan products could have lead to the deposits. Chemical byproducts can react with these residues, as well as wastes, debris and contamination, causing a problem with "scum" deposits. Various pool cleaning products are available to help clean the water line areas. The best products are those that are formulated so as not to cause pool water foaming. Some of the cleaning products use enzymes to help with the removal. In addition, there are enzyme products that can be added directly to the water and will help digest and decompose oily, organic residues. Good luck. Enjoy the summer!